YES Staffing Workers are the Best Utah Professionals! This month YES would like to show gratitude for an employee who functions much like a glue between one of our main offices and our largest on-site office. 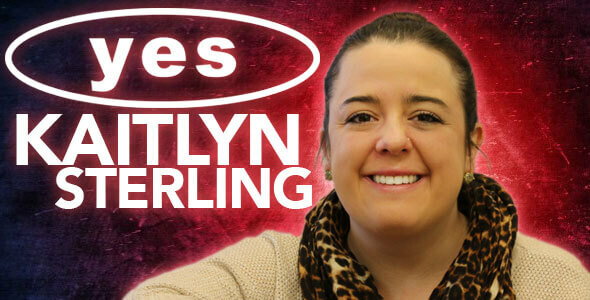 This is a big shoutout to Kaitlyn Sterling! Kaitlyn works closely with our Ogden office in preparing and training applicants for work at our largest on-site client facility, and then works closely with our On-Site Managers at that location to onboard all new hires appropriately. This particular client has numerous training, testing, and documentation requirements that are crucial to their business and legally required and Kaitlyn's organizational abilities, attention to detail, and excellent customer service has been crucial to our maintenance of that account. 1. Hanging out with my hubby and daughter. 2. Playing with my two pups. 3. Shopping for sure haha. 4. Traveling, I love going to places I have never been to before and I like revisiting cities I have visited and fell in love with. The environment and everyone I work with. It is a great work environment and everyone I work with is so awesome. Everyone is always smiling and so willing to help each other. Honestly nothing, YES is pretty awesome, but a soda fountain in the break room would be pretty legit. It’s a tie between Charleston SC and Preston MD, my hometown. 7. Would you rather go have a sideline pass to a Patriots game or a backstage pass to a Pentatonix concert? Sideline pass to a Patriots game for sure! I love Pentatonix, but I have been a Patriots fan for far longer than I have been a Pentatonix fan. Putting the right person in the right job for themselves and for our client. Each department we work with is so different and the job duties vary a lot. Explaining each department as thorough as I can. I tell them the good, the bad and the ugly so they are set-up for success when they walk in for their first day of training. It’s hard to envision a job and what it entails while just looking through a window, so I try to explain as much as I can about the job, the environment and what is expected of them. You are in good hands. We will find take the time to find the right job for them. 11. You, Reed, and Kerry have a crab opening contest. Who wins between the president of YES Reed Laws and YES' CFO Kerry Westenskow? Haha! Neither of them will win because I will beat them both at that. BUT if I sit out of that competition and it’s down to just Reed and Kerry I will have to say Reed. Picking crabs gets pretty messy and Kerry is too much of a pretty boy for that, haha! We're extremely grateful to have you on the team Kaitlyn! Thank you for all that you do!